betul cakap Leslie tu. i love sweet buns. are those buns sweet? sounds pretty easy too. maybe i shud go get some yeast myself. lol. p.s. btw, is it in powder form (the yeast)? Gert, is it hard to work with yeast? I've never dare try working with yeast. I'm scared instead of proofing, I get poofed. 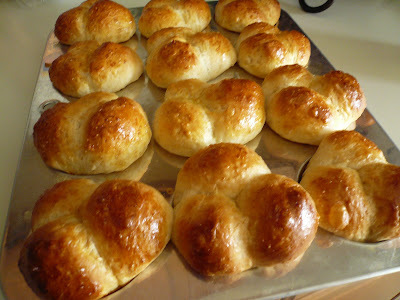 The dinner rolls do look delicious. Is the loaf of bread in the last pix from the same recipe? those cute buns look so lovely! PJ, hope you will make some. I used the powder (dry) yeast. JOAT, actually it is not hard at all the work with yeast. Why don't you try to make some. Give me a call if you encounter any problem. Yeah, the little loaf of bread is from the same recipe. Thanks for the recipe. Looks easy to me. Hey, want to check with you is the bun soft? if you left it overnight will it still be soft. 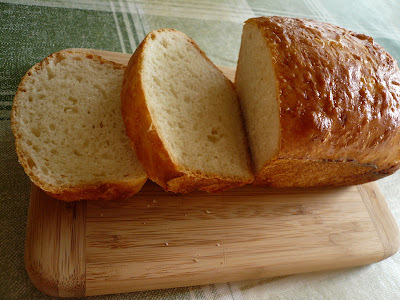 Remember, my Hokkaido Milk Loaf I did last Saturday, after I left it ovenight, it is not as soft as the 1st day. It became semi hard then the 3rd day became hard and got to steam it b4 makan lah. Is this normal ah? Must beli the buku recipe buat bread and study. Sue, this bread is not as soft as those sell at the Chinese Bakery. 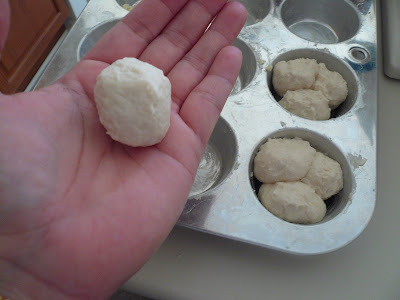 I always warm in up in the microwave for 30 second and they became soft again and is really good with some butter. 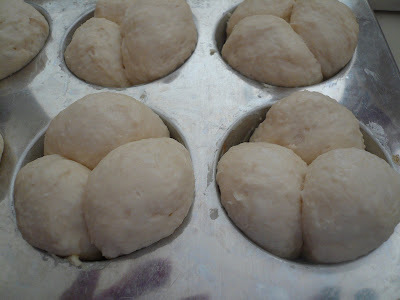 I notice in Malaysia lots of people bake their bread with some bread softerner. Maybe that might help to make the bread softer. I think you can get that from those bakery supplied shop. Too bad I can't find any here. well arent they cute!! i dare not bake my own bread.. dont have the guts lah! recipe looks easy though..
Do you think shortening will help. I came across some recipe require shortening. Maybe I should try it first la see jadi or not. Gert, each time I look at the rolls, I have a feeling it's salty. Smear it with butter and YUM! oh Gert, so simple, yet a lazy dish which so incredible yummy, such a creative dish.... once glance, I was imagining of yam rice. Cool something new to me and to explore in my kitchen. Sue, I am not sure about shortening in bread. Never try that before. Let me know if it works. BBO, yeah I like yam rice too. 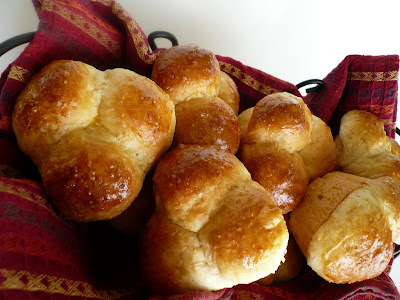 i've made these dinner rolls the other day and did exactly like in the photos and it turned out gorgeous. My question is about the proofing you mention, letting it over night, could you give me a somewhat amount of time? How many approximate hours to leave it ?? Sakura, because of our cold weather here, i proof it for 10 hours. YOu don't have to leave it overnight. You can do it during the day and if the weather there is warm it will only take about 2-3 hours to proof.